Hylec News | UK Electrical Distributors – E. Preston (Electrical) Ltd.
A range of terminal blocks that can withstand extreme temperatures is available at Hylec-APL, the specialist supplier of electrical components and enclosures. Steatite High Temperature Terminal Blocks are dimensionally stable up to 1,000 degC. They suit applications such as boilers, water heaters, cookers, injection moulding machines, and other uses where connections are required around heating/heating and hot water equipment. The Steatite High Temperature Terminal Blocks range offers robust ceramic construction with nick-plated brass inserts and zinc-plated steel screws. The range is available in two variants, with and without steel inserts. The standard range offers ten different models: two single pole versions to suit 4mm² and 10mm² standard conductor sizes with maximum current of 32A and 41A ; three 2-pole models, with the larger device suitable for up to 57A maximum current; three 3-pole models (32A, 41A and 57A maximum current) and two 4-pole versions (32A and 41A). They are off-white in colour. 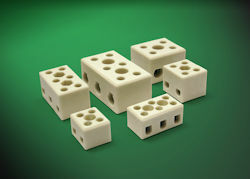 Steatite Ceramic Terminal Blocks with steel inserts offer additional strength and stability. Four models are available: a two pole and a three pole to suit 32A (max) current applications and a two pole and a three pole for applications up to 41A. Sizes are range between 15.6mm high x 18mm wide x 21mm long up to 23mm high x 29.5mm wide x 52mm long. The Steatite High Temperature Block family is RoHS compliant, VDE and CE approved. Hylec-APL is a market leader in the manufacture and supply of electrical and electro-mechanical components to major OEMs and CEMs, wholesalers, and specialist & catalogue distributors. 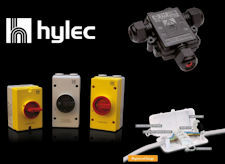 Hylec-APL’s innovative, extensive and patented product portfolio includes Debox in-line junction boxes, isolator switches, enclosures (stainless steel, steel & ABS), water and weatherproof connectors, cable glands, terminal blocks, fuse holders and many others marketed under the brand names Debox and Hylec. A British company established for over 30 years, Hylec-APL is focussed on developing strong, long-term business partnerships with its customers, distributors, wholesalers and partners through its all-pervasive service culture, an active and knowledgeable field sales force, and a large inventory of available parts. Hylec Debox S and SL make installers and contractors’ lives easier and save hours of installation time by including everything installers need to join flat or round profile cables, including a UL and VDE-approved 4-pole terminal block. On a typical commercial lighting project, saving a few minutes on each cable join means speedier overall installation and lower costs. Hylec weather and waterproof electrical connectors that have been used in some interesting projects, including re- illuminating Blackfriars Bridge in London and Pavegen flooring technology which converts kinetic energy from footsteps into off-grid electricity and has been used in public outdoor locations around the world. The TeeTube range includes the IP68/IP69K TH381 Series micro connector, only 14mm in diameter, ideal for outdoor lighting applications, such as architectural lighting, street lighting, underwater lighting, illumination of road signs and billboards and the connection of interior and exterior Class 2 electrical devices. Hylec’s range of PCB terminal blocks and fuse holders probably boast the best quality/price ratio currently on the market. This year’s new additions include the new screwless push wire TLM Series in multiple pitches to optimize board design, as will pillar terminal blocks and high temperature terminal blocks. Enclosures are another product area that Hylec has years of expertise in designing and marketing inlcuding the IP-66-rated DN junction box enclosures that include a 35mm DIN rail and mounting screws for simpler mounting of terminal blocks, relays and connectors. The DN range carries multiple slots for vertical PCB mounting, making this product an excellent and flexible choice for both electrical and electronic applications, as it is totally dust tight and provides protection against water jets, waves and rain. This exceptional robustness also extends to meet the IK08 impact standard. Hylec-APL, the specialist supplier of electrical components and enclosures, has announced the extended TLM Series of screwless PCB terminal blocks. Needing no special tools, the TLM Series offers fast connection for wire sizes between 0.05mm² and 8.37mm² and are shock-resistant. Devices within the TLM Series are available in multiple styles and pitches to offer designers optimum flexibility in design and the possibility of saving valuable PCB real estate. Just a short description of a few of the terminal blocks within the TLM Series illustrates the breadth of this comprehensive series. The TLM250C is available from 2-pole, has a sprung screwless push wave design with long pin close to the side cover. On a 2.50mm pitch, rated voltage is 250V, rated current 2A and minimum wire size AWG20. The TLM250D models are the short pin close to side cover equivalent, again rated for 2A/250V. The TLM900R is also available from 2-pole, with a sprung screwless pushbutton wave horizontal 2.54mm pitch design which is end stackable. Rated voltage is 150V, rated current 2A, with wire sizes 26 – 20AWG (0.2/0.5mm²). An equivalent vertical model, the TLM900V is available too. On a 3.50mm pitch, the TLM002C and TLM002D are 2 pole spring screwless pushbutton Wave designs with either long pin close to side cover or short pin close to side cover. The single row, design is rated 250V, 2A, with a wiring orientation of 135 degrees wire to board. The TLM-302R screwless push button design on a 5.08mm pitch offers rated voltage of 300V and rated current of 10A in 20 – 14 AWG size. The design is 180 degrees wire to board. Three new 300V 15A devices with 2 – 24 poles, designated TLM-203B, have now been added to the TLM Series which will continue to be expanded, with new models currently in development. The three new TLM-230B models are available in 5.00mm, 7.50mm and 10.mm pitches, with rated voltages of 300V, rated current of 15A for wire ranges between 28-12AWG(0.2-2.5mm²). Suitable for through-hole mounting and in pushbutton Wave and tool-operated variants, Hylec’s screwless push wire PCB terminal blocks are available in green, with some styles also available in grey, black and orange. Hylec also supplies matching green and black fuse holders. New rectangular semi-enclosed PCB fuse holders are now available from Hylec-APL, the specialist supplier of electrical components and enclosures. Manufactured from flame-retardant UL94 V0 Polyamide in accordance with IEC 127-6, these fuse holders are a high quality, competitively priced product which comply with multiple approval standards, including the latest EN Glow Wire Test standards at 850degC. The fuse carriers and retainers are finger proof to avoid damage to the fuse during placement on the PCB. Enclosed contacts are a further feature of the new rectangular fuse holders, again safeguarding them from damage during assembly. Designed for PCB mounting on a 22.6mm pin pitch, with a PCB hole size of 1.5mm, the DFH14N fuse holder (including spigot) and the DFH14HBN fuse carrier are rated to 6.3A/250V. Contact material is tinned nickel plated brass and contact resistance is <5mΩ. Power dissipation is 2.5W and dielectric strength 3KV/60°. Insulation resistance of the DFH14N fuse holder (including spigot) and the DFH14HBN fuse carrier is 100mΩ. The rectangular fuse carrier and retainers are available in black and green. Hylec also manufactures a very wide range of PCB terminal blocks in various colours, including black, green and orange. Hylec’S IP66 DN Enclosures range is a very flexible solution for the vast number of applications needing protection against water ingress that also house components requiring either visual checking or frequent access. They will withstand repeated opening and closing with no loss of sealing integrity. A 35mm DIN rail and mounting screws for simpler mounting of terminal blocks, relays and connectors is included, and the DN range also carries multiple slots for vertical PCB mounting, making this product an excellent and flexible choice for both electrical and electronic applications. Manufactured from flame-retardant ABS, its exceptional robustness also extends to meet the IK08 impact standard. 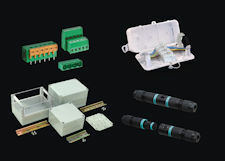 Hylec’s comprehensive range of PCB terminal blocks is suitable for virtually every application. 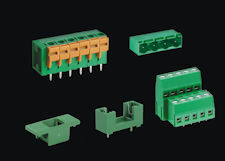 Enabling secure transmission of signals, data and power to PCBs, Hylec’s wide range of terminal blocks feature a space-saving connection method ideal for multiple OEM applications in consumer, processing and industrial applications. 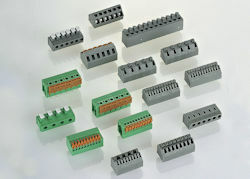 In virtually every type and style, as well as standard though-hole mounting and wire protected designs, there are plug & socket (right-angled and vertical), board-to-board (pluggable) and screwless, push-wire terminal blocks, plus rising clamp PCB terminal blocks in single, double and triple-decker styles which save valuable board space. Manufacturers can also find a comprehensive range of PCB fuse holders and PCB DIN rail supports at Hylec. 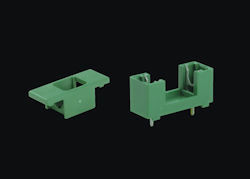 The PCB fuse holders and cover are available in green and black, on industry-standard 22.6mm pitch. Compact and UL- and VDE-approved, they are available at very competitive prices. As a result of the structure and design of the tool, Hylec DIN rail mounting PCB supports offer a superior degree of rigidity compared to most others available on the market, and are available in a greater range of sizes. Hylec is well-known for its extensive ranges of junction boxes, terminal blocks, door enclosures, weatherproof connectors and HVAC components, and among these is the new 80A Rotary Isolator switch, the latest addition to the ROTARY ISOLATOR range of AC and DC switches for industrial and commercial buildings. IP67-rated and able to withstand water up to a depth of 1 metre, ROTARY ISOLATOR switches enable fast shut down in emergencies and ensure the circuit is completely de-energised for routine service and maintenance. With plenty of internal space for ease of installation, this range offers best-value/performance on the market. Another new product that has taken the trade by storm since its introduction in April is the TH381 TeePlug, a completely submersible waterproof micro-connector for underwater and harsh environment installations. IP68/IP69K-rated and only 14mm in diameter, the TeePlug TH381 Series provides complete protection against high pressure water jets too. Its push-pull design installs up to 80% faster than competitive waterproof connectors. The TH381 Series suits outdoor lighting applications, such as architectural lighting, underwater lighting, road sign and billboard illumination and connection of exterior and interior Class 2 electrical devices. The Debox range of in-line junction boxes, including the 100% tool less Debox SL can be assembled in a few seconds. 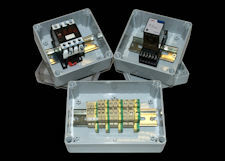 It is supplied complete with a 16A, UL and VDE-approved, 4-pole screw-less push wire terminal block, DeboxSL joins flat or round profile cable and includes everything to save electricians on-site installation time and reduce costs. No tools are required: after inserting the cables and closing the included cable clamps, the lid is simply snapped shut and held with the supplied locking clip. This innovative cable junction box from Hylec-APL is IP20 protected, flame retardant to UL94V-0, and suits internal applications, including ring main lighting, LED lighting and power. 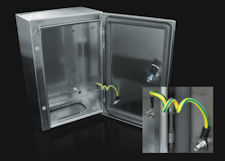 Hylec-APL, the specialist supplier and manufacturer of electrical and electronic components and enclosures, today announces its new DEDSS Stainless Steel Series of lockable, solid door enclosures specially designed to provide high-quality, secure, cost-effective protection for specialist and demanding electronic and electrical installations. The DEDSS Enclosure Series is IP66 rated and protects contents against water and dust, as well as being able to withstand impact to IK10 specifications and extremes of temperature ranging between – 20degC and +55degC. Suitable applications for DEDSS enclosures include corrosive environments, such as the chemical and petrochemical industries, and environments where strict hygiene is required, for example, the agro food sector. The rugged DEDSS enclosures range is manufactured from grade 304 stainless steel and supplied as a complete kit. This includes a metal lock and key, a 2mm galvanised steel back plate, and external mounting feet and spacers. In addition, DEDSS enclosures come complete with an earth strap pre-wired and fitted between the door and the housing to save valuable installation time. This comprehensive range encompasses six different sizes, ranging from 300mm high x 200mm wide x 150mm deep to 500mm high x 500mm wide x 200mm deep, so offering a wide choice capable of accommodating most installations. Many accessories that fit the DEDSS range are available from Hylec: cable glands, Kwik-Fix cable glands, venting elements, contactors/thermal overloads, filter fans and other fans. Hylec-APL, the specialist supplier of electrical components and enclosures, announces new model in its range of Isolator switches, which provide fast electrical isolation for multiple applications, including industrial machinery, commercial buildings, power supplies, security equipment and HVAC. Isolator control switches are IP67 rated and withstand water up to a depth of one metre, as well as completely preventing the ingress of dust and dirt, vital in many factory and commercial applications. Safety is of paramount importance in such environments, and Isolator control switches ensure an electrical circuit is completely de-energised for routine service and maintenance and can be shut down quickly in the unlikely event of an emergency. The Isolator switch separates the circuit from the main power source and discharges any current trapped in the circuit, rendering it safe to work on and of course ensuring fast shut down and the absence of any electrical current when an emergency stop is required. When used as an emergency stop, it can be locked in the off position using a padlock (not supplied). For safety, the switch is interlocked with the lid to prevent opening while in the “on” position. The interior mechanism is a 4-pole rotary isolator switch disconnector used to switch power to commercial or light industrial applications. Isolator control switches are manufactured from completely flame retardant polycarbonate, rated to UL94V-0, providing an additional margin of safety over competitive products with a lower flame-resistance rating. 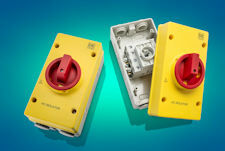 As well as being flame retardant, housings are robust and highly visible, with yellow covers and red control switches. The new 80A AC Isolator model features silver-plated alloy contacts for high reliability. Earth terminals are included, as well as captive retained cover screws. The 80A AC Isolator has a compact footprint, but its internal dimensions are a generous size, measuring 9cm wide by 17.3cm long, so there is space to manipulate cables easily during installation. Hylec-APL, the specialist supplier of electrical components and enclosures, announces the launch of the new TeePlug® TH381 plug and socket electrical micro connector designed for underwater use and harsh environment installations. 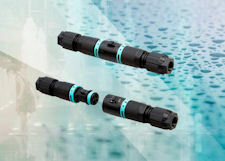 Offering the highest levels of reliability, TeePlug TH381 Series connectors provide complete protection against the effects of permanent submersion in water to ensure electrical connection, even when subjected to high pressure water jets. The IP68/IP69K rated TeeTubeTH381 models also prevent dust and dirt ingress. Measuring only 14mm in diameter, the TeeTubeTH381 Series suits outdoor lighting applications, such as architectural lighting, street lighting, underwater lighting, illumination of road signs and billboards and the connection of interior and exterior Class 2 electrical devices. TeePlug TH381 connectors feature a push-pull design that installs up to 80% faster than competitive waterproof connectors, saving valuable time on-site and reducing cost. Intuitive and functional in use, TeePlug TH381 connectors incorporate a special coupling system that confirms correct alignment and mating with an audible click and also prevents accidental disconnection, even against opposing forces of 25kg (8Kg according to EN61535). Models with an additional optional safety system are available to further protect against disconnection by requiring the use of a tool such as a flat-blade screwdriver for uncoupling. TeePlug TH381’s IP68 water resistance rating is guaranteed even when subjected to bending forces of up to 5Kg, and they are resistant to high pressure water jets up to 100Br, 16l/min at a water temperature of 80degC. Vibration and external mechanical stresses are no problem either, as cable traction is prevented up to a force of 8Kg. Electrical specification is 2-poles, 10A – 400V AC/DC. Wire section is 0.25mm² to 1.5mm² without ferrules. TeePlug TH381 Series plugs and sockets are available in two variants, cable to cable and panel-mount, and in two sizes to suit cable diameters between 5.8mm and 6.9mm and 7.0mm – 8.0mm. Cable reduction grommets are available for smaller cables, as are additional accessories, including sealing caps, a dedicated spanner for quick, safe installation, a bigger cable gland for larger cables and a rear nut for panel-mounted installations. Building on the heritage of the proven TeePlug range, the new TeePlug Series TH381 is the optimum electrical connector for all submerged and challenging installations.